The Nest - Kenneth Oppel’s most haunting story yet . . .
She was very blurry, not at all human looking. There were huge dark eyes, and a kind of mane made of light, and when she spoke, I couldn't see a mouth moving, but I felt her words, like a breeze against my face, and I understood her completely. "We've come because of the baby," she said. "We've come to help." In this beautiful, menacing novel, perfect for fans of Neil Gaiman’s Coraline, an anxious boy becomes convinced that angels will save his sick baby brother. But these are creatures of a very different kind, and their plan for the baby has a twist. Layer by layer, he unravels the truth about his new friends as the time remaining to save his brother ticks down. With evocative and disquieting illustrations by Caldecott Medal– and Governor General’s Award–winning artist Jon Klassen, The Nest is an unforgettable journey into one boy’s deepest insecurities and darkest fears. Shade is a young Silverwing bat, the runt of his colony. But he's determined to prove himself on the long, dangerous winter migration to Hibernaculum, millions of wingbeats to the south. During a fierce storm, he loses the others and soon faces the most incredible journey of his young life. Here's your chance to meet two great authors at one time! Sturat Gibbs & Ken Oppel each have new books, perfect for a summer escape. Stuart Gibbs presents Poached, the long-awaited sequel to Belly up. Ken Oppel, an award-winning author of the beloved Silverwing triology, enters a totally new time and place with Boundless. Read St. Louis presents Kenneth Oppel. "The Boundless," the greatest train ever built, is on its maiden voyage across the country, and first-class passenger Will Everett is about to embark on the adventure of his life! When Will ends up in possession of the key to a train car containing priceless treasures, he becomes the target of sinister figures from his past. In order to survive, Will must join a traveling circus, enlisting the aid of Mr. Dorian, the ringmaster and leader of the troupe, and Maren, a girl his age who is an expert escape artist. Meet Kenneth Oppel, award-winning author of Half Brother and the Silverwing, Airborn, and Apprenticeship of Victor Frankenstein series. Oppel will appear in Boise Public Library’s Hayes Auditorium at the Main Library on Wednesday, October 16, at 7:00 p.m.
Oppel has received numerous awards for his books, including the Governor General’s Award for Children’s Literature and the Michael L. Printz Honor Book Award, and many of his books have been named Best Books for Young Adults by the American Library Association. Kenneth Oppel reads from Such Wicked Intent: The Apprenticeship of Victor Frankenstein, Book Two. Photo by: Jim Gillett About the Author: Ken Oppel has published more than fifteen books for children. 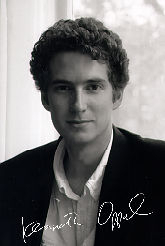 In 1995, he won the Air Canada Award for the best Canadian writer under the age of thirty. Formerly Books for Young People Editor at Quill & Quire magazine, he now writes full time. He lives in Toronto, Ontario, with his wife and children. Book: When does obsession become madness? Tragedy has forced sixteen-year-old Victor Frankenstein to swear off alchemy forever. He burns the Dark Library. He vows he will never dabble in the dark sciences again—just as he vows he will no longer covet Elizabeth, his brother’s betrothed. If only these things were not so tempting. When he and Elizabeth discover a portal into the spirit world, they cannot resist. Together with Victor’s twin, Konrad, and their friend Henry, the four venture into a place of infinite possibilities where power and passion reign. But as they search for the knowledge to raise the dead, they unknowingly unlock a darkness from which they may never return. What: Ken Oppel will discuss and sign his newest novel for young adults, Such Wicked Intent. When: Wednesday, September 5, 7:00 p.m. Where: Blue Willow Bookshop, 14532 Memorial Drive, Houston, TX 77079 Admission: In order to go through the signing line and meet Ken Oppel for book personalization, please purchase Such Wicked Intent from Blue Willow Bookshop. A limited number of autographed copies of Ken’s books will be available for purchase after the event. If you cannot attend the event, but would like a personalized copy of his book, please call us before the event at (281) 497-8675. There are still openings in our Young Adult book group! We focus on a wide variety of genres — and the latest titles in the YA category, which makes it the perfect opportunity for readers to branch out and find new favorites! Come in and grab your copy of our current selection This Dark Endeavor by Kenneth Oppel. Our latest selection will be announced at the meeting. Book club members receive 20% off of the current book club selection! Kenneth Oppel discusses Half Brother. Kenneth Oppel is currently considered a "single author." If one or more works are by a distinct, homonymous authors, go ahead and split the author. Kenneth Oppel is composed of 5 names. You can examine and separate out names.